I named this set my Puzzle of the Year in my Notable Puzzles of 2011 blog post. If you missed the "CROSS" WORD CONTEST you can (and should!) still print out and solve the set, a landmark in the history of NYT crosswords. Read the notepad. Notepad: "CROSS" WORD CONTEST — All the puzzles this week, from Monday to Saturday, have been created by one person, Patrick Berry. Have your solutions handy, because the Saturday puzzle conceals a meta-challenge involving the solution grids of all six. When you have the answer to the meta-challenge, mail it to: crossword@nytimes.com. Twenty-five correct solvers, chosen at random, whose entries are received by 6:00 p.m. E.T. 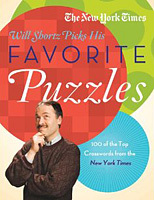 Sunday, Oct. 23, 2011, will receive copies of "Will Shortz Picks His Favorite Puzzles: 101 of the Top Crosswords From The New York Times" (puzzle list.) Only one entry per person, please. The answer and winners' names will appear on Friday, Oct. 28, at Wordplay. The unusual fifth (Friday) puzzle was only offered at the NYT as a PDF. In fact, the only electronic version ever made available is right here on XWord Info. 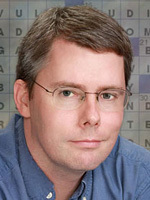 Post-solve links: If you remembered this history and this 2006 Patrick Berry puzzle you might have been able to guess the gist of the theme from the contest title alone. The "circles" have been added to all six solutions above in case you missed them. Wordplay interviewed Will Shortz and Patrick Berry about the puzzles and the contest. The prize itself is interesting. It's a collection of daily crosswords Will Shortz himself chose as his favorites from September 2002 through 2010. You can see the list of puzzles here but the real value of the book is reading Will's personal commentary on each one, and for that, you need to buy the book.